Raisins Not Virgins, an English play written, directed and acted (in the first production) by Bangladeshi-born American writer Sharbari Zohra Ahmed, has been brought to Bangladesh by Farhan Quddus of Excalibur Entertainment and Sadaf Saaz Siddiqui and M K Aaref of Jatrik Travels to revive the English theatre scene in Dhaka. As a writer of the Writers' Block, Sadaf comments, "there are lot of writers writing short stories and poems in English but there doesn't seem to be much theatre going on in English. To kickstart, a kind of revival of English theatre within Bangladesh, we have tried to put on these shows." "We want to showcase Bangladeshi talents worldwide and bring them to Dhaka," adds Farhan. "We were looking for people of Bangladeshi origin making a mark abroad and we found Sharbari's off-Broadway play and we felt that we must showcase that," continues Sadaf. Sponsored by Purnava and Aqua Paints along with other sponsors the play was hosted and staged at IUB's multi-purpose hall on March 10 and 11. The play was staged before in New York in 2005 at the Workshop Theatre Company, informs Sharbari who had played the lead role then. She says, "the inspiration for this was when I saw the footage of Mohammad-al-Durrah, the twelve-year-old boy being killed in the West bank I believe or the Palestinian territory by Israeli snipers. It was one of the most horrific experiences of my life." A year later terrorist attack took place in New York and Sahar Salem began to take shape in the author's mind. "The combination of Muhammad-al-Durrah's death and 9/11 made me think about my Islamic and American identity," she says. Sahar, a woman in her late twenties, growing up in New York among immigrant Bangladeshi parents, averts from Islam at a young age. Like most young women of her age, she is burdened with the aspirations of her parents and cultural norms and in an attempt to conform to those, she comes across Rizwan, a prospective husband. While this character supposedly brings love to her lonely and apparently directionless life, she is also brought in direct confrontation with her lost faith. Instead of shying away, this time she tries to understand it, search and answer all her questions in her own way. In the end she does end up finding both love and faith, but again in her own terms. 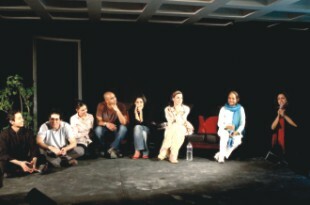 The cast of Raisins Not Virgins along with the author-director, Sharbari Zohra Ahmed (extreme right). Photo: Zahedul I Khan. Laila, a trained vocalist and an educational consultant by profession, says, "I really love the character because she is so full of life and energy. She has so much passion and she asks questions that most young people ask today- whether it is the question about her identity or where she is from. She hits very topical points and questions them." Laila, who was involved in a theatre group in New York and herself produces skits here in Dhaka, feels that as a performer, her desire is to make the audience think. Although, most people can relate to Sahar's relationship with her mother, for a Bangladeshi audience growing up in a homogeneous society, her criticism of her faith and her boyfriend, Rizwan's family's over-exertion of religious practises may appear a bit strange. Even, Rizwan's, (an American-born-Bangladeshi corporate lawyer) decision to stay back in Palestine to help the oppressed people there, appears too sudden. In fact Murali, a Canadian-Sri-Lankan expatriate working in Bangladesh, playing Rizwan's role finds it difficult to rationalise. "I think he makes a noble decision to go help overseas. It is noble but he might be doing it a little bit for ego as well," says Murali. Amma, played by the eminent Bangladeshi actress Mita Rahman, in her semi-negative yet amusing role of Sahar's mother, receives the loudest applause and appreciation by the crowd. "Amma - this character is universal. Although, it is modelled, I suppose, on a Bangladeshi-American woman, who has lived long in America, raising a family there, you find mothers like that all over the world. It cut across all cultures," comments Mita. "It is a comedy, so it is funny but underlying it, it is quite serious because this woman is very sincere. She actually means well," explains Mita. As a result, the audience finds Amma accepting her daughter's new-found love even though he is from a different race and religion. "I felt that Amma was in sort of a lack-lustre marriage. She is living the life through her daughter. Then again lot of mothers do that," adds Mita. Both Mita Rahman and J R Adduchi, a professional actor working in films, television, theatre in New York and playing Aaron in Raisins Not Virgins, give full credit to Sharbari for the witty dialogues and well-crafted, flawless characters. Adduchi, who recently won an award from Charlotte, Carolina for "Emerging Actor of the Year" and played the role of Stanley Kowalski in "A Streetcar Named Desire" by Tennessee Williams, says that Sharbari has allowed him to explore and the final result is evident in the laughs of the audience. About his character, Aaron, a Jewish professor and photographer, who falls in love with Sahar, Adduchi says, "he represents the intellectual, thinking and socially conscious youth of the world." Another character that has made a notable presence is Mariyam, Rizwan's sister, who has transformed into a practising Muslim from a partying youth, after her marriage to her convert American husband. Mariyam, played by the novice Ulfaath Kuddus says, "For Mariyam what she wears is not necessarily her identity. She is still the person that she was. She has taken on the hijab just to support her husband." Ulfaath says she can relate to the character because as in the play Sahar mistakenly judges Mariyam by her hijab, in Bangladesh, too we are often judged by our appearances or our reactions towards certain aspects in life. Interestingly, most of the characters in the play including the Imam, played by Aref Syed from Dhaka and the female Rabbi, played by Imogen Butler Cole from the US are not stereotyped and has a more humane side to themselves. Even a small role like that of the heretic Muslim woman in the mosque played by Naila Azad Nupur, a prominent Bangladeshi actress, does not lose its significance in the entire plot. Naila Azad is also the assistant director of the play. In spite of being a comedy, the play touches on serious issues like feminism, religion, jihad, mother-daughter relationship, love relationships, culture, faith and societal norms. Some of the topics are so sensitive that the producers were apprehensive of the reaction from a Bangladeshi audience. However, the director and her crew have pulled it off neatly and with loud applause to varied groups of audience. Although some of the crew members have problems expressing their emotions, projecting their lines and at times failed to depict the timeline or sequence of the events, the overall show has been 100 percent entertaining. The screenplay version of Raisins Not Virgins has also been accepted at a programme of the Tribeca Film Festival in 2008 and viewers all over the world should be awaiting the movie version, since preproduction work of Raisins Not Virgins has already started and shooting is due on 2012.